Cooking this week really challenged my patience and my skills. It’s not easy to cook in the rain, and a cold winter rain, at that. Of course, it didn’t start raining until I’d already set out the coals, so I was in for a fight. I was cooking, as usual, on my back porch, which has no roof nor guard. All I had to keep the coals dry was this big metal dutch oven hood/cap thing my mother-in-law had bought me. The problem with using that is that it’s not very well ventilated, and so every time I’ve tried to cook with it, it ends up slowing the burning, or even putting out the coals. But my idea was to bake some bread, in kinda small loaves, more like big rolls, and then slice them open and hollow them out and pour chili into them, like boats, then top it with some fresh veggies, sour cream and cheese. In the end, I won the battle with the elements, and the food turned out great. The first batch of bread even cooked as I fought to figure out how to keep it dry and hot on the back porch. The second batch of bread was cooked on the nice, covered, dry front porch. That’s where I also finished cooking the chili. Still, it did my heart good to see how the back porch bread turned out, because I was so dejected and convinced it was going to flop. But it was nice and done all the way through, with a beautiful golden, slightly-crispy crust. This particular bread recipe uses honey, too, so it’s a bit sweet. The bread recipe is really the big experiment of the day, not so much the chili. The chili was the same stuff I did last July (except I used stew meat instead of venison this time). The night before, I soaked the beans, and I put those on the coals to cook first. They actually cooked quite a while before the rain started. I started by mixing everything in the first set of ingredients, and letting it sit for 5 mintues or so for the yeast to foam up. Then, I mixed in everything in the second set, and stirred it up. Finally, I added the flour, a few cups at a time, stirring and blending as I went. Once I got close to 9 cups or so, I started adding them one at a time. You’re trying to get a nice smooth moldable consistency where it’s not runny and sticky, but not hard to mold in your fingers. I think this time I ended up using 11 cups, not counting the stuff I sprinkled on the table top for kneading. Then, as it got mixed up, I dumped it out of the bowl and onto the floured tabletop to knead. About 10 minutes. I don’t know why, but I have this thing about doing it all by hand instead of using a mixer. It makes it more fun, I think. Finally, all kneaded, I set it back in the greased bowl and let it rise. While it was rising, I got worked some more on the chili. I chopped up all the veggie ingredients and combined all the spices. After an hour or so the bread had risen, so I punched it down and divided it into eighths. These I shaped into elongated rolls, kinda the shape of hoagie buns. I set them into the two 12” shallow dutch ovens and set them aside to let them proof (raise again). In about a half hour, they were ready. Now, ordinarily, I would have just put them out back with their own coals, and cooked all three dutch ovens at the same time. But, in this case, the rain had started, and I only had one hood. So, I had to set some bricks on either side of the 12” deep dutch oven (with the chili in it), and stack one of the bread dutch ovens on top of it, and then cap it all with the hood. The second batch of bread would have to wait. Then came the fussing and fretting and the trying to keep it hot and dry. But eventually, it all worked out, and I could see that it was done. I’m always very nervous about pulling bread off the coals. I’m always afraid that it’ll be doughy raw in the center. This time, I got out a knife and checked before I brought it in, and I left it on the coals an extra five minutes just to be sure. It turned out great. One thing you MUST do when baking bread is rotate the oven every 10 to 15 minutes, and rotate the lid as well. That’ll prevent hot spots and burns. The chili? Not so much. While this first batch of bread was baking, I saw that the beans were cooked, and I added the veggies and the spices. Mmmm, I love the smell of cinnamon in with the chili powder! It was about that time that I decided that the fight was over, and moved everything to the front porch. I didn’t try to move the coals, by the way. I had some already lit in a chimney, and so I just carried that around front, and set it up all over again with fresh coals. As a result the second dutch oven of bread cooked quite a bit faster. I mixed all that together and splashed on some lemon juice, as well as salt and black pepper. Toward the end of the chili being done, I sprinkled in a few tablespoons full of flour, just to thicken it up a little. I like my chili thick, especially if I'm eating it with bread. When everything was done, I sliced open the bread, hollowed a bit out and poured on the chili. 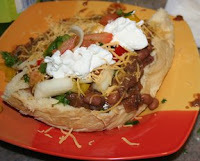 Then I spooned some of the fresh veggie mix on top, and finally smothered it in shredded cheddar and sour cream. Wow! What a taste treat! This sounds great. I am going to a football party/ chilli cook off this weekend and plan on using my DO instead of hauling my stove. I might have to try this one tonight to see if there is something from it I can bring into the compatition. I just found your site and love it I will follow it more now.